Considering the correlation between economy and fraud, we have to be extra cautious for preventing to become identity theft victims during a bad economy. During downward economic times when every piece of the economy seems to be headed south squeezing every one in its path and people have a hard time to provide basic necessities for their families, fraud is expected to increase as a last available option. Committing fraud is not an easy task for most people however, when kids are hungry or cold, and the rent is due, some people have no option but to commit fraud to provide food, clothing, medicine, and shelter. The focus of this article is the impact of the economy and fraud committed by individuals and not the organized groups. Fraud committed by individuals is relatively small, for basic needs and tends to increase with tough economic times whereas fraud committed by organized groups is steady and not correlated to economic conditions, is greed driven, and generally big with huge impact in terms of total fraud amount and impact on the number of individuals affected. As we continue to experience tough economic conditions in the employment market, financial markets, and housing with high inflation and lower cash value, we are squeezed in more ways that we can have imagined. The implications of such circumstances are devastating for most people including the explosive combination of less income and higher prices resulting in reduced ability to buy quality food, have quality family time, guarantee a solid savings and retirement account, receive minimum health care, and provide a roof for the family. As such, people are forced to commit fraud in bad economic times which impacts a good portion of the population. There have been many reported cases of stolen gas from cars, stolen car parts for resale in the copper and silver markets, and home burglary for valuables. As I had previously indicated, some individuals have been selling gas at half the listed price at gas stations with stolen credit cards. This is a win-win situation for both the sellers and buyers of gas at the expense of stolen credit card owners. 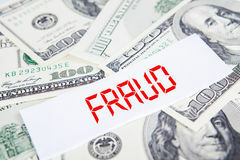 A tough economic time with an impact on a good portion of the population is a perfect fraud storm because it induces the general population to participate in the fraud process. For example, taking the gas case mentioned above, the fraudsters will not be able to benefit from the stolen credit cards if the general population is not willing to participate in the fraud process by buying cheap gas knowing that purchased gas is paid for with stolen credit cards. However, the general population is more willing to commit fraud in tough economic times than during a normal or prosperous economy. Knowing that economy and fraud are correlated with identity theft and fraud risks being much higher during a weak economy, we have to be much more vigilant these days in protecting our identity and valuables. Some recommendations include don’t let strangers into your house without surveillance and supervision, and stay with your car when buying gas. Visit the Identity Management Institute's website after reading the "economy and fraud" article.